Carbing Radiator Cooling Plate - Dezod Motorsports Inc - Home of the automotive performance enthusiast since 2002. 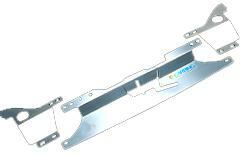 The Carbing Radiator Cooling Plate works by increasing the air flow into the radiator by redirecting the air stream above the radiator. Most vehicles will see an average 40ºF (5ºC) reduction in water temperatures. Each panel is precision made to fit and function perfectly on every vehicle. Available in A5052 aluminum or carbon fiber (limited applications).